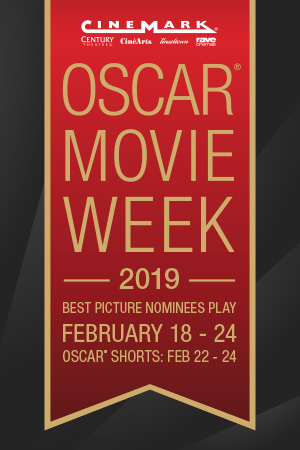 Oscar Movie Week at Cinemark is February 18 to February 24! Buy individual tickets for showtimes soon. NOTE: Purchase your festival pass now and pick up your Oscar Movie Week festival pass at your local theatre starting February 9! Select 'Change Theatre' to change location enter your ZIP code and find any participating theatres near you. See the short film nominees during Oscar Movie Week. Shorts include Animated and Live Action categories only. *Plus applicable sales tax. Festival pass includes admission to the Oscar® Shorts. Shows are limited to first come, first serve basis. Limited seating. **Each coupon is valid for one item only. One coupon per transaction. Coupon code and barcode must be visible. Coupon offer valid for the purchase of refills for the Annual Refillable Drink Cup and Popcorn Tub when applicable. Coupon offer not valid for initial purchase of the Annual Refillable Drink Cup and Popcorn Tub. To redeem: Present coupon at concession Stand. Check out the coupon policy page for full details and restrictions. Choose who you think will win at this year’s Academy Awards®. Check out the Oscar Ballot and follow along as the winners are announced on February 24th. Please select a participating theatre from the list below.